Use as a utility pouch, a magazine dump pouch as well as a 1 quart canteen cover. 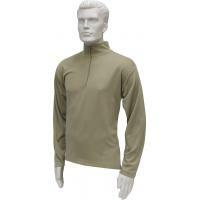 Made of water repellent, puncture & tear resistant, Heavy Duty 1000 Denier nylon which has been IR treated. What makes our gear special is the care we take in the materials we use to put it all together. 2. Berry Compliant. The Berry Amendment goes beyond being "Made in the USA", it means every component was made and produced in the USA along with the labor to cut and sew the end item. 3. IR treated components such as Plastic Hardware, Webbing, Elastic, Fabric, Cord, etc. If a component can be seen through the enemy's night vision goggles, we have made sure an IR treated component was used or we tell you otherwise. This item has a small amount of hook and loop (also known as Velcro®) which is used on the small water purification tablet pockets. Currently we are not aware of any company making IR treated hook and loop but as long as these pockets are kept closed, IR treatment should NOT be a problem. Please note: The ABU Camo pattern is controlled by the US Air Force, thus the ABU item can only be shipped directly to official US Military addresses. The ACU version of this item can ship to any address.